Learn how to create a performance review system that improves employee morale and retention. Developing and retaining employees is a challenge for any business. This becomes an even greater challenge when working with remote teams or freelancers. But you don’t need to over complicate things. Keeping remote employees happy requires the same steps it takes to keep in-house employees happy: constructive feedback, and a path for advancement. So whether you’re managing an in-house or remote team, follow by step-by-step guide below to implement a morale-boosting performance review system. The first thing to understand about performance reviews is that good employees actually want them. Any employee who cares about their career and work will want to know where they stand within the organization. They want to know how to improve, and what future opportunities are available to them. If you’ve hired great people, they will want reviews, which means you won’t have to expend a lot of time or political capital generating buy-in from the team. This is particularly true for remote employees. Many remote employees feel removed from the larger organization. 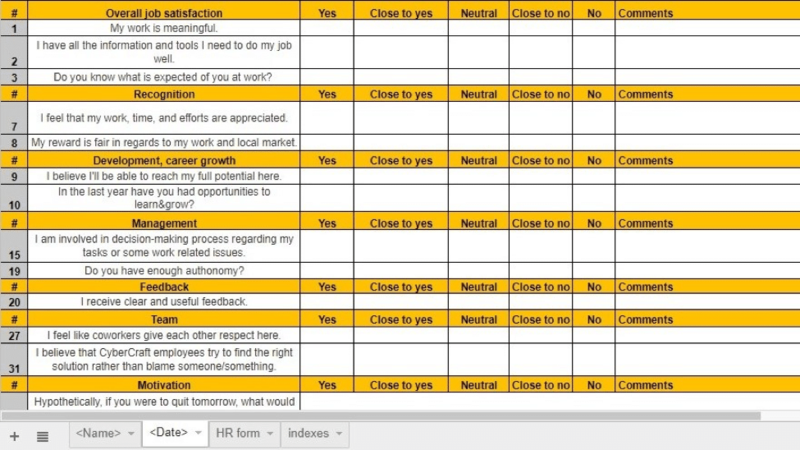 Well organized and employee-focused performance reviews is a great way to make your remote employees feel included. Of course, performance reviews can be implemented in an infinite number of ways, and getting it right isn’t exactly easy. If you create a one-sided review system that focuses more on criticism than opportunity, your performance review system can backfire. Instead, follow the steps below to build a collaborative and inclusive review process that is sure to boost employee morale and retention. Define a goal. Determine why you’re building a performance evaluation process, and what you hope it will achieve for your business. Decide who’s going to be involved and how. Are there multiple meetings? Will senior leadership get involved? Clients? Peers? Determine how frequently the evaluation will be conducted. We recommend bi-annually. Define what to evaluate and how to measure it. 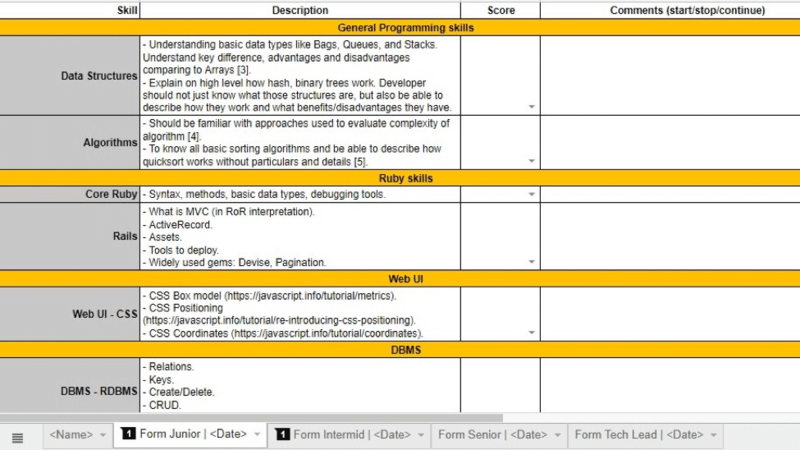 Create an evaluation template (see details below). Evaluate the process. Measure how effectively your process helped achieve your goal (created in step 1). Most importantly, involve your employees to ensure your process will deliver them the feedback they want and need. After you answer these questions for yourself you can actually start designing the evaluation form. Identify top-level categories, like: technical skills, dependability, collaboration, etc. If you are in a managerial or HR role, ask for help from technical management when designing the technical questions. Nothing will frustrate a developer more than a poorly conceived technical evaluation. Determine what the scores add up to. Is it just a number for number’s sake? Or will a certain score lead to a promotion? A raise? A change in seniority? Letting employees know what to strive for will lead to great buy-in from employees. When you are first starting out, don’t worry about making the form look pretty. Once you have refined the process over a few iterations, you can consider investing in a performance management software. Now that you’ve thought through your process and designed the templates, it’s time to put your plan into action. 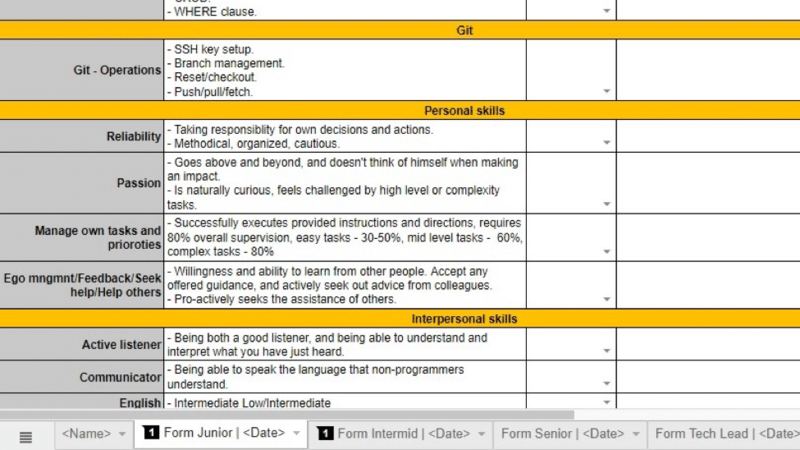 Day 1: Send out self-evaluations, and manager evaluation forms. Day 8: One-on-one conversations with employee and direct-manager. Day 14: Full evaluation completed and entered into employee records. This way employees have a firm understanding of how the process is going to unfold, and what to expect. This ensures no one is confused or frustrated by an inefficient or aimless exercise. This all may seem like a lot of work, but in all, it shouldn’t take more than a few days of hard work to pull off and frankly it’s worth it.Any employee who is worth keeping around will be interested in receiving constructive feedback and understanding their path toward promotion. By giving employees a clear understanding of their current standing at the company and how to advance you are likely to boost morale, productivity, and eventually retain more employees. And as an added bonus, this will even help you recruit great new employees. By showing candidates that you have a process for career advancement, they will see you are an organized company that cares about helping employees develop their careers. Good luck and let me know if you have any questions or thoughts in the comments section below. Irene is a talent manager with broad experience from recruiting to management and retention of remote development teams throughout EMEA.